What’s the Difference Between Gen Z's and Millennials? WHAT’S THE DIFFERENCE BETWEEN GEN-Z'S AND MILLENNIALS? Most Millennials were between 5 and 20 years old when the 9/11 terrorist attacks occurred, have grown up during the Iraq and Afghanistan wars, and took part in electing America’s first black president. They have seen and taken part in a world that transitioned from dial-up-technology to today’s instant connection via the internet. They entered into adulthood and the workforce during a recession and up until the Gen-Zs have been the most racially and ethnically diverse adult generation in America’s history. Gen-Zs, those born in 1995 or later, grew up in a technological environment. They’ve always had the internet at their fingertips. Terrorism and global warming have been a part of their world from the beginning. How they see the world is unlike any generation before. They are more informed, more involved, and more empathetic than previous generations. 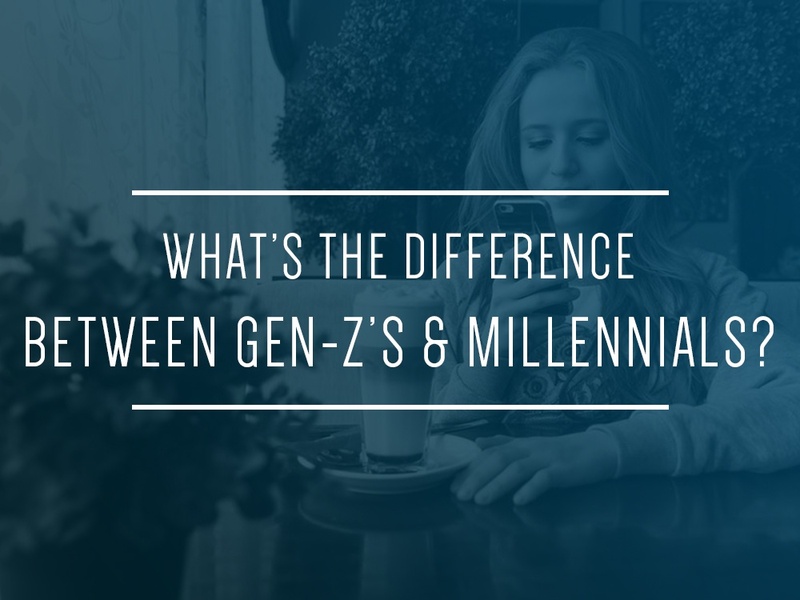 Knowing the difference between Millennials and Gen-Zs is important. It will help you shift your marketing, leadership and recruiting efforts to remain relevant to the up and coming generation. Did you know that 72% of high school students are entrepreneurial? Millennials often have a “side hustle” but the rising Gen-Z’s are starting businesses, and they are doing it while still in high school. College is no longer the expectation as it was for Millennials. Up and coming Gen-Z’s are thinking outside of the box. Millennials asked Corporate America to adjust, think creatively, and embrace change and new technologies. Gen-Z isn’t waiting for Corporate America to catch up, they are paving their own path and telling companies to catch up. In fact, companies are wise to reach out to social media micro- influencers when marketing to Gen-Zs. Gen-Z lives in a world of continuous updates. They are processing more information than generations before them. With more online alternatives to school than ever before Gen-Zs are more likely to skip the classroom than Millennials and opt for a less traditional, more affordable form of education. They’ve always had a world of information at their fingertips and are using that knowledge to reshape education and how they enter the workforce. Gen-Z’s most-used social platforms are Snapchat and Instagram. These platforms represent their need to consume and connect. According to “It’s Lit: A Guide to What Teens Think is Cool,” a report from Google, teens feel that being yourself, embracing what you love while rejecting what you don’t, and kindness to others is what being cool is about. Activities that resonate with them represent their struggle between technology and living real life. Millennials love mobile apps and social media. Their top social media platforms are Facebook and Instagram. They view Google as serious and functional, a wealthy source of information, while Gen-Z sees Google as fun and functional enjoying the Easter eggs and the ability to connect on a global scale. Understanding the unique values of each generation will help you remain relevant to the up and coming generation. Both value quality. Both have entrepreneurial drive. Both have their fingers on technological change and the future. It is the intricate details of how these similarities play out that separate them from one another and that should guide your decisions in reaching them. Each generation brings unique expectations to the marketplace that must be met.